Many people dismiss aches and pains as everyday occurrences, especially younger persons. But taking care of the body's joints is important at any age to help avoid problems later on. According to the U.S. Center for Disease Control and Prevention, a study of patients from 2007 to 2009 found that one in five adults in the United States reported having doctor-diagnosed arthritis, one of the biggest culprits of joint problems. Dr. Denny Carter, an orthopedic surgeon at Southeast Georgia Health System in Brunswick, explains just what arthritis is. 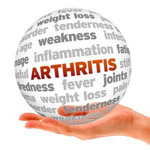 "Arthritis means the inflammation of a joint. In some forms of arthritis, such as osteoarthritis, the inflammation arises because the smooth covering -- articular cartilage -- on the ends of bones becomes damaged or worn," Carter said. Other forms of arthritis, such as rheumatoid arthritis, occur when the joint lining becomes inflamed, which, Carter says, is part of a disease process that affects the entire body. While it is primarily a condition that affects the elderly, it is something a person at any age should understand, particularly women. "More than 70 percent of individuals in North America affected by arthritis are over the age of 65," Carter said. "Arthritis is more common in women than men at all ages, and affects all races, ethnic groups and cultures. Children can also be affected by the disease." Understanding arthritis is important for members of younger generations who might not be directly affected, because that is when prevention is best started. Carter suggests several ways to ensure proper care. "Maintaining overall good health and strength with exercise and good nutrition can be helpful in preventing joint disease," he said. "Avoiding obesity is important, because our joints are not designed to handle the extreme pressures caused by being overweight." When exercising, Carter recommends making sure that injuries are taken care of properly. "It is also important to seek treatment following injury to prevent further damage to joints that can lead to joint disease and osteoarthritis," he said. As with many conditions, preventative measures are important as well as early detection. The earlier the problem is detected, the more treatment options might be available or have a greater chance of being successful. This is particularly true in the case of arthritis. "Currently, prevention of arthritis focuses on avoiding joint injury and early diagnosis and treatment," Carter said. "Research clearly demonstrates that early diagnosis and treatment can result in less damage, deformity, disability and even mortality in rheumatoid disease. The treatment of rheumatoid disease is not only more effective but easier when administered early."